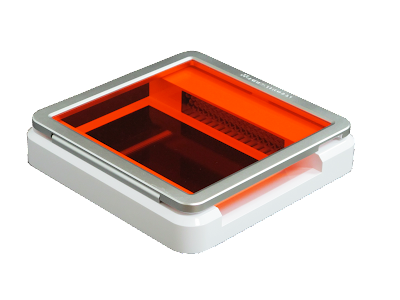 The UltraBright LED Transilluminator is designed for viewing stained gels on the laboratory bench,or within gel documentation systems. Light from the LED source inside the instrument producing light with a narrow emission peak centered at approximately 470nm, effective for the excitation of nucleic acid and protein stains such EtBr, SYBR®Safe, SYBRGold, SYBR®Green I&II, SYPRO®Ruby, SYPRO®Orange, Coomassie Fluor™Orangestains, GelGreen, GelRed and Lumitein™ ProteinGelStain. To be the most compact LED illuminator, Maestrogen tried to design an LED illuminator not to be a conventional LED trans-illuminator or an epi-illuminator. It comes out the design concept of MaestroGen UltraSlim. MaestroGen UltraSlim is used for DNA gel cutting. It saves your lab spaces. The sensitivity for using MaestroGen UltraSlim is high enough for DNA gels. For DNA gels stained with EtBr, the sensitivity is up to 2 ng, while the sensitivity is even better than 1 ng when stained with safe dyes.